While those of us on the June 11th organizing crew focus on prisoners with long sentences, and sometimes point out how disproportionately long these sentences are based on the justice system’s own sentencing norms, it is not because we are criticizing the government for being unfair. Rather than lobbying for fair sentencing, we seek the total destruction of all prisons: both as physical cages that kidnap people, and as a logic of social control that includes surveillance technologies, parole, and ankle monitors. While we support those who can finagle the state’s own laws to get comrades released as early as possible, we’re committed to those who are still waiting and those for whom this is not possible. We want to push the boundaries of what that commitment means. Our emphasis on long-term sentences is to make sure our comrades continue to receive support as time moves forward. The person who has been the focus of June 11th the longest is Marius Mason. Marius is an anarchist, environmental and animal liberation activist who is currently serving a 22 year prison sentence. He plead guilty to taking part in an arson of a Michigan State University lab conducting GMO research for Monsanto in 1999, as well as twelve other acts of property destruction. Marius was imprisoned in 2009 during the Green Scare, a time when the U.S. federal government was cracking down on earth and animal liberation struggles. He was incarcerated in a high security unit until 2017 when, after constant advocacy by outside supporters, he was moved to general population. Finally, earlier this year Marius was moved from Carswell to Danbury, where he is much closer to many of his friends and family. In 2014, he came out publicly as transgender, using he/him pronouns, and eventually secured access to hormone treatment in 2016. For more information, check out the website his support team maintains. Sean Swain went on hunger strike during the month of September after prison administrators removed some of his privileges in response to his writings. Michael Kimble was one of eight Holman prisoners in June 2018 beaten by the riot squad and thrown in lockup with seemingly no pretext. Eventually he was released back into general population. Jeremy Hammond was attacked by a guard after accidentally bumping into them, put in the solitary confinement for months, and then transferred to FCI Memphis with a higher security status. He has been removed from college courses and a counseling program that would have reduced his sentence by a year. Eric King has been placed in solitary confinement after defending himself from a guard’s attack in August 2018. He was transferred to USP McCreary, where his communication has been severely restricted. Joaquín Garcia has been sentenced to 13 years in prison for the bombing of a prisoner guard training facility in Chile. Connor Stevens of the Cleveland 4 will be released from prison in April 2019. Freddy Fuentevilla, who was imprisoned with two comrades 10 years ago for bank robbery and the murder of a cop, was released into parole in July 2018. Lisa, convicted of robbing banks in Aachen, was placed in solitary and then released back into general population earlier this year. All charges in the J20 case in the USA have been dropped for the remaining defendants. This would not have been possible without all the support and coordination work done behind the scenes by defendants and their supporters. Repression of anarchists continues especially in Russia and Italy. Russian anarchists are being tortured and arrested for membership in a fake organization called “The Network.” In Italy, the state is conducting multiple operations to clamp down on anarchists, including the ongoing Operations Scintilla, Renata, Panico, and Scripta Manent. Most of this information would never have gotten out if it wasn’t for folks doing support work for anarchist prisoners. 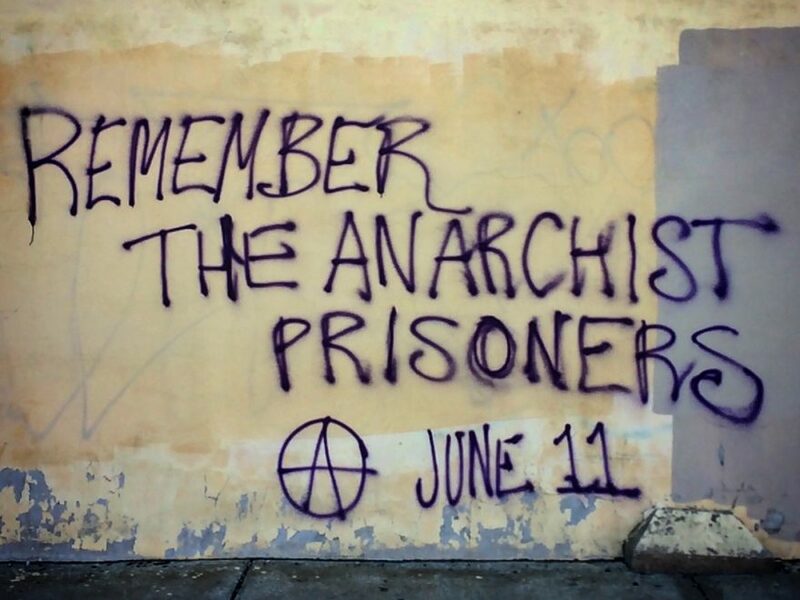 Thanks to all the support crews out there, the Anarchist Black Cross, Greek Imprisoned Fighters Fund, and everyone taking initiative to support imprisoned anarchists. We are calling on anarchists around the world to take initiative in whatever way speaks to one’s own heart. In the past, we have seen solidarity attacks, noise demonstrations, graffiti, letter writing nights, dance parties, fundraisers, and much more. In the coming months, we will be posting additional content to build up towards June 11, 2019. As always, we welcome posters, art, fliers, prisoner statements, report-backs, communiques, and anything else. Check out june11.org for more information.